On a recent visit to my home town Glasgow, I hit the town. Glasgow has changed enormously in the past decade and the central areas of Buchanan Street, Queen Street and Ingram Street are virtually unrecognisable from my time there although these areas have always been a hub of shopping, bars and clubs for the hip and happening. Ingram Street alone (which runs from the Glasgow Museum of Modern Arts in Royal Exchange Square) is filled with designer brands and clothing stores: Agent Provocateur, Ralph Lauren, Jaeger, Mulberry and Cruise (pictured left; Glasgow’s version of Browns) with two enormous stores is the mecca for designer shopping bunnies. And, in true Glasgow style, where there are spendy designer stores, there will be exclusive bars and clubs where the young and wealthy can play, though being Glasgow, all are welcomed. 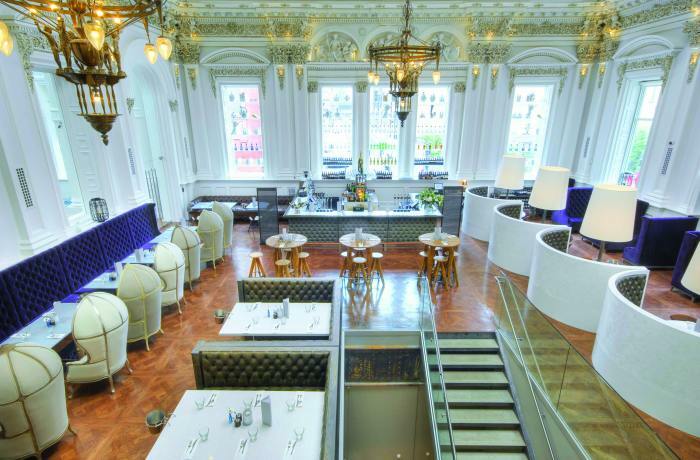 The Corinthian Club in Ingram Street has long been one of my favourites. The building itself is glorious and beautifully neo classical ornate – an old Court House, this is used to seeing more risque types. I remember when it first opened in 1991, I went along with a Glasgow friend who was an independent fashion retailer and ‘known face’ about town. She commented as she walked through the door, “I’ve been a witness in that area (which was the dock) more times than I can remember…I may still recognise some of the less salubrious faces,” which gives you a clue to the humour and wryness of the city and how we take things right back to basics. The Corinthian Club dates from 1842 and is an elaborate plethora of sculptures, decoration and rich stained glass which could rival any grand European city – there’s an aura about the place which says ‘old style’ and dignity which is why there’s such a pull to this club. This massive venue has cleverly been divided into different areas with different feels and appeal to the wide range of customers. The beautiful and awe inspiring grand atrium hosts the massive dome which streams light through to this grand room with juxtaposing modern decor. The area immediately to the left of this area has been transformed into a casino which is open seven days a week form 2pm-6am so it sees a variety of customers depending on the time of day/night. There are also two rooms – the champagne bar with it’s mirrored walls and fragrance displays and the Bootleg Bar that’s ‘Rock Star’ in feel and serves drinks in brown paper bags for authenticity. The basement area of The Corinthian is the ‘young’ area with a relaxed European beer keller feel in wood and brick and also hosts Club Mash with mirrored and velvet walls. Upstairs on the first floor, there’s a discreet piano bar (Charlie Parker’s – a nod to the original club that existed in Royal Exchange Square in the 1980’s so attracts a 30/40-something crowd) as well as stunning private rooms filled with Peter Lavery fashion photographic prints. The Laird’s Room, (another private area) boasts a Scottish theme in a very modern manner – antlers, prints and wood abound. 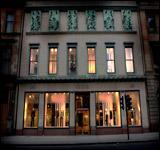 The second floor leads to more private rooms for hire such as The Langley which mirrors Glasgow’s George Square in stencil imagery while the 3rd floor has a screening room. The Corinthian Club caters for smokers with one of the most scenic ‘smokers areas’ on the roof with views across central Glasgow. This is like a personal club in itself. There’s a feel with the Corinthian that you could keep discovering it forever and I love how it manages to cater for all ages and types. There’s the steal of a £49 membership per year which gives the owner free and preferred entry after midnight (no queing) and treats them to a bottle of champagne on their birthday. Tearing ourselves away from this venue, we headed to Club 29, a private members bar/club in Royal Exchange Square. Existing over two floors and with a large roof area, Club 29 also has a Grill Room, Supper Club, Network Bar and Oyster Bar. It’s another place to add to the list of must-sees and home to Glasgow’s wealthy and elite including lots of celebrities but I still preferred the old school elegance and refinement of The Corinthian Club. It’s a guaranteed return visit on my next trip. Let me know what you think of my Glasgow reviews by leaving a comment in the box below. Thanks.